I never had patience required to master the piano. I do, however, have a very healthy appreciation for those who have. 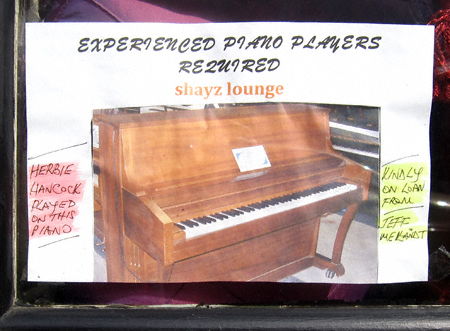 For this reason I couldn’t resist passing along this solicitation for pianists at Shayz Lounge. No details are given as to what (if any) compensation is in the offering. But hey, you get to twinkle the same ivories as Herbie Hancock— and there’s something to be said for that!